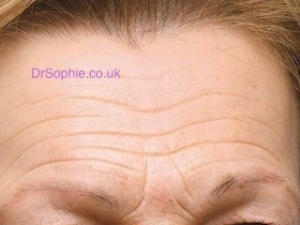 Horizontal lines across our foreheads, there are so many treatments which claim to get rid of these, but ultimately if you really want to see a dramatic improvement there are a few treatments which can do wonders especially Botox®/antiwrinkle injections, “fillers” or “Skin boosting”/mesotherapy . Dramatic improvements can be achieved in one treatment, however, the exact treatment you chose depends on a number of factors, which will all be discussed with you at your free consultation. Generally if you are having Botox®/antiwrinkle injections treatments for the horizontal lines across your forehead it is usually a good idea to treat the vertical frown lines between your eyebrows at the same time in order to balance out the shape of the eye brow. 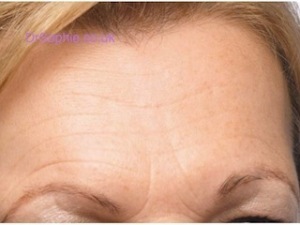 Special notes for forehead lines treatment; One of the simplest ways to treat these is with Botox®/antiwrinkle injections, one of the great advantages of using Botox® is that there is virtually nothing to see on leaving the clinic, you can just go back to your routine and no one need know your secret. Although you should avoid strenuous exercise for around 4 hours afterwards or a massage within 24 hours after treatment.